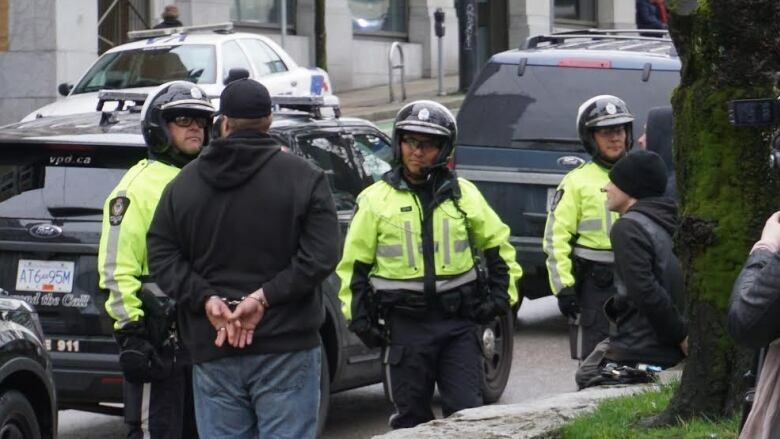 An anti-racism rally took an ugly turn Sunday when police were forced to intervene after members from the group Soldiers of Odin disrupted the event. International Day Against Racism rally organizer Imtiaz Popat said about a dozen white men in black hoodies started following the march as it moved down Hastings Street towards Victory Square. Video shot by rally attendant Fatima Jaffer shows a skirmish breaking out in the crowd at Victory Square before police move in to break up the fight and handcuff some of the SOO members. "They obviously meant to intimidate." said Jaffer. "The tension was building. The cops were standing and watching." Popat said police should have intervened sooner. "The police just watched basically until they started physically attacking the crowd," said Popat. According to VPD spokesman Const. Jason Doucette, three men who identified themselves as SOO members were arrested for breach of the peace and removed from the crowd. "The three men were released without criminal charges...after it was determined their detention was no longer necessary to keep the peace," said Doucette in a statement. The Soldiers of Odin is an international anti-immigrant street patrol organization which started in Finland in 2015 and has been connected to other far right movements. Earlier in the rally one of the SOO members dropped a smoke bomb, according to Vancouver East MP Jenny Kwan, who was speaking at the time. 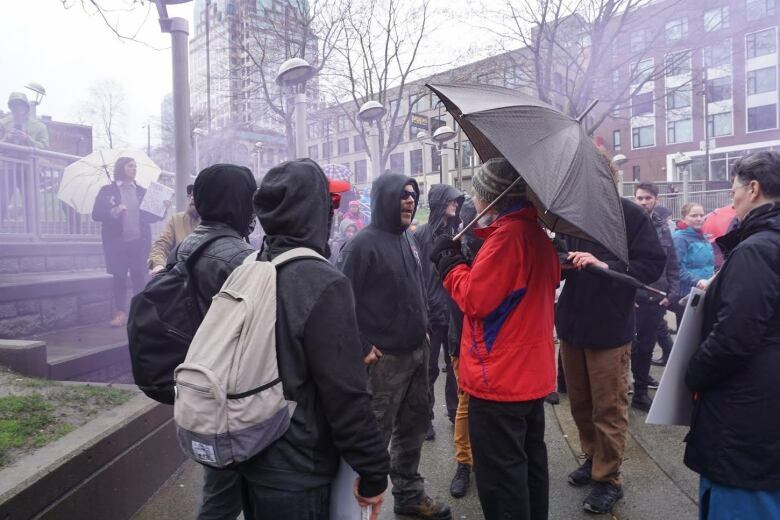 "One particular individual was moving through the crowd in a very assertive way, talking about how he's anti-immigrant and fascist," said Kwan. "And then the individual dropped a smoke bomb. It sprayed purple smoke and was being kicked around. It bothered your eyes." The smoke bomb was eventually kicked away from the crowd, according to Kwan, and the rally continued. 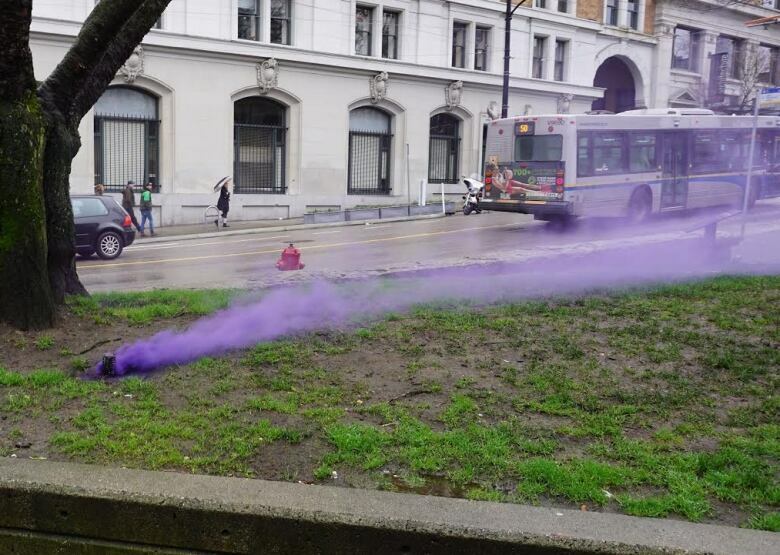 Kwan provided photos of the smoke bomb to CBC News but Const. Doucette said the VPD, "has not located any evidence of a smoke bomb."